It was Angel's 6th birthday on Saturday and besides going for her Primary 1 orientation, we were going to watch The Enormous Turnip and that was something the kids were very much looking forward to. 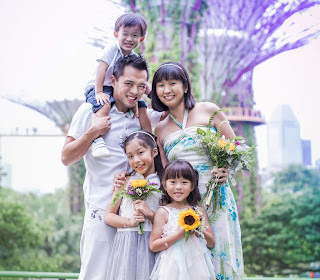 In fact, they have been counting down to this day and asking "Mummy, when are we going to watch the 拔萝卜show?" 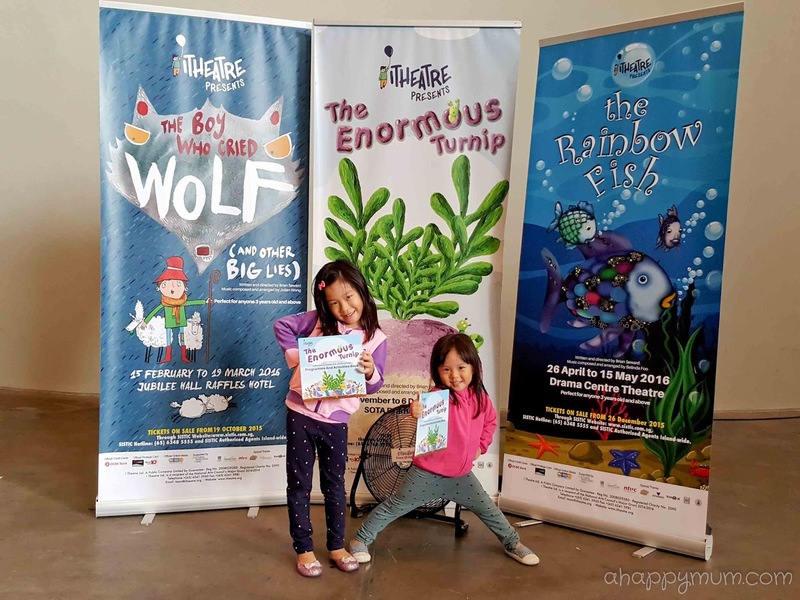 Held at the School of the Arts Drama Theatre, The Enormous Turnip is a witty, engaging and interactive play that is designed for children aged 3 to 12. 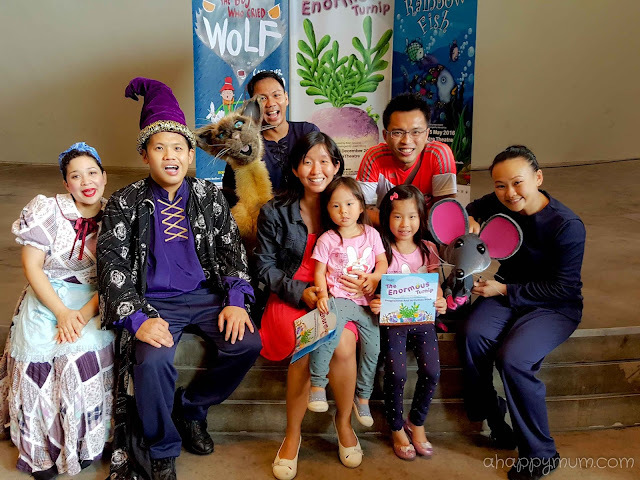 As mentioned in my previous post, the girls are all too familiar with the story and nursery rhyme, thus they were really thrilled that they were going to see the show live on stage! The show lasts for approximately 50 minutes with no interval, do make sure you arrive on time as it usually starts quite promptly. Babies are also allowed to enter provided that they have a ticket, which is really good news for me because this means we will be able to continue watching theatrical productions even when the baby arrives next month. 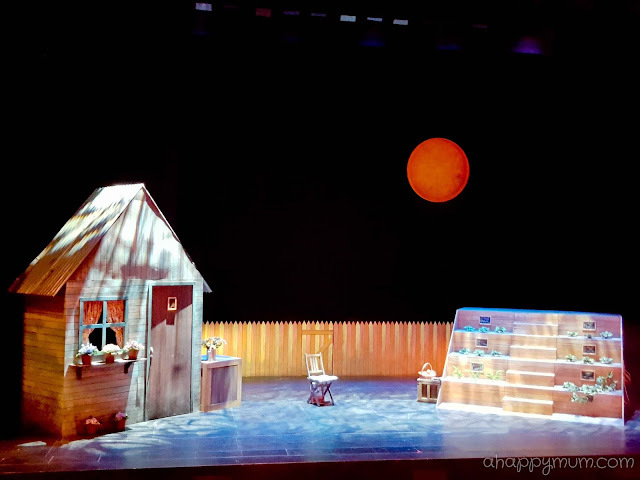 I love the stage setup which looks welcoming though straightforward, with farmer Diggory's house on one side, the garden on the other, a fence behind and a bright orange sun in the sky. 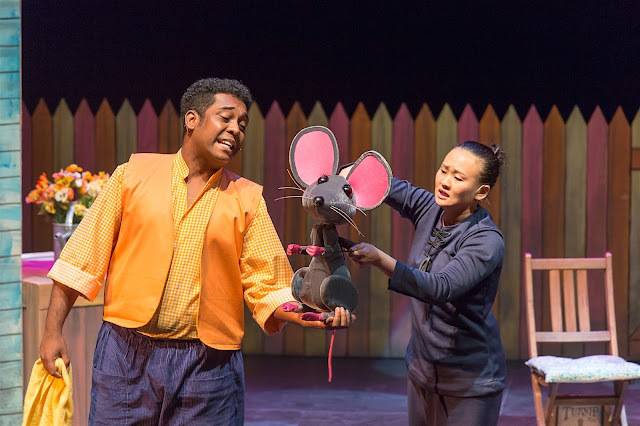 The use of puppetry is something fascinating for the young audience and helps to bring the cute characters such as the mouse, cat and caterpillar to life. 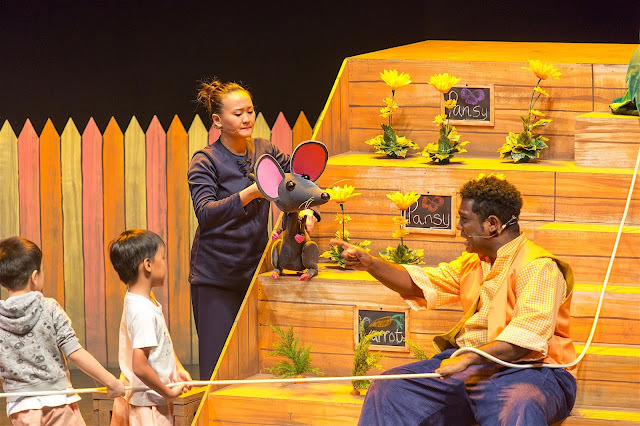 The girls particularly loved Eek the mouse which plays a pivotal role in the show and even though he ate up Diggory's seeds at first, he makes up for his mistake by protecting the plants and of course, helping to pull the enormous turnip out of the ground eventually. One of my favourite characters in the show is Mrs Diggory who never fails to bring on the chuckles when she makes an appearance. I also like that the show involves singing and dancing which helps to keep the kids captivated and enable them to better understand the plot too. 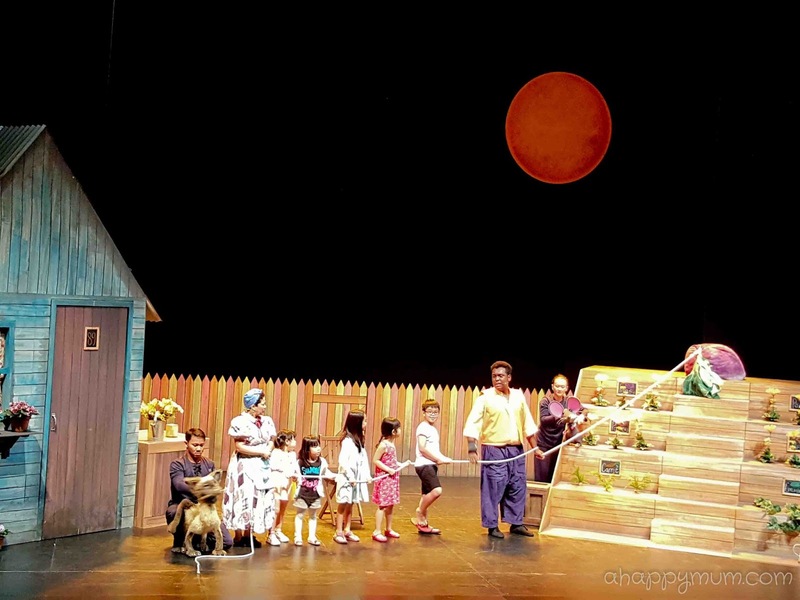 The best part about the show, to me, is how the cast keeps it interactive throughout, for instance they will pose questions to the audience which the little ones will only be too excited to shout out answers and they even chose some children to go up on stage to help in the pulling of the turnip! One key learning point from the show is that no one is too small to make a difference and you should never let anyone judge you by your appearance. The kids also learnt about the importance of teamwork and how we should value the contributions of everyone, no matter how insignificant they may seem at first, and we must always be considerate and think of other people's feelings. I have to say it was definitely a treat for the girls who can't stop talking about the mouse on our way home and they were so happy that we managed to meet and greet the cast. 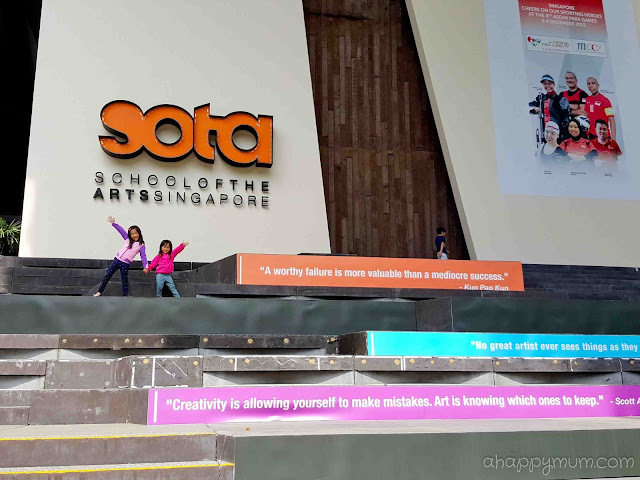 I guess this was a great birthday gift for my big girl and we are definitely looking forward to watching more theatrical productions in the future! 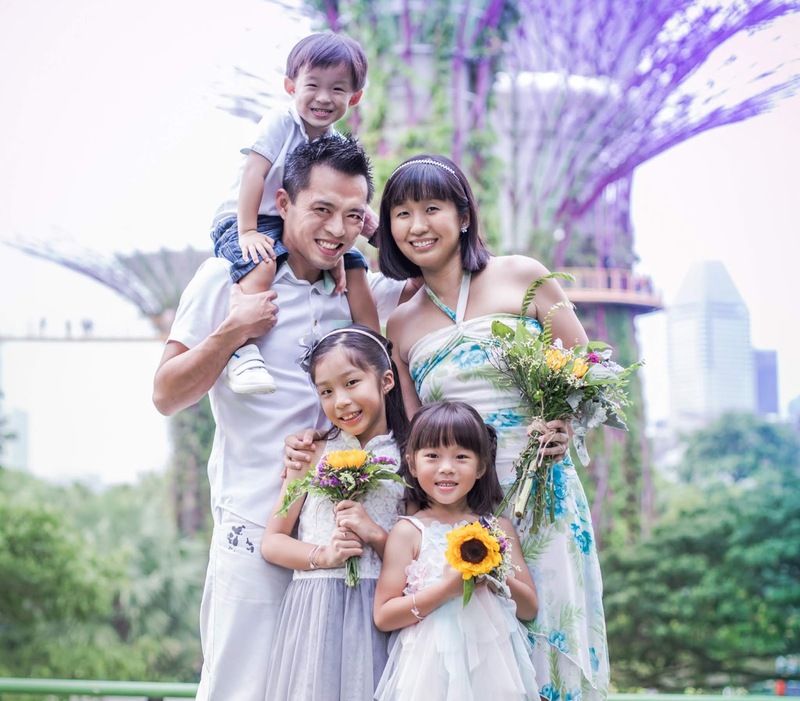 Tickets are now available through www.sistic.com.sg, SISTIC hotline (65) 6348 5555 and all SISTIC outlets. I Theatre is one of the region’s premiere professional producing companies for family orientated theatre, creating an average of four brand new theatre productions a year. It aims to produce theatre experiences that will be as accessible and challenging, funny and thought provoking to an adult as to a child. 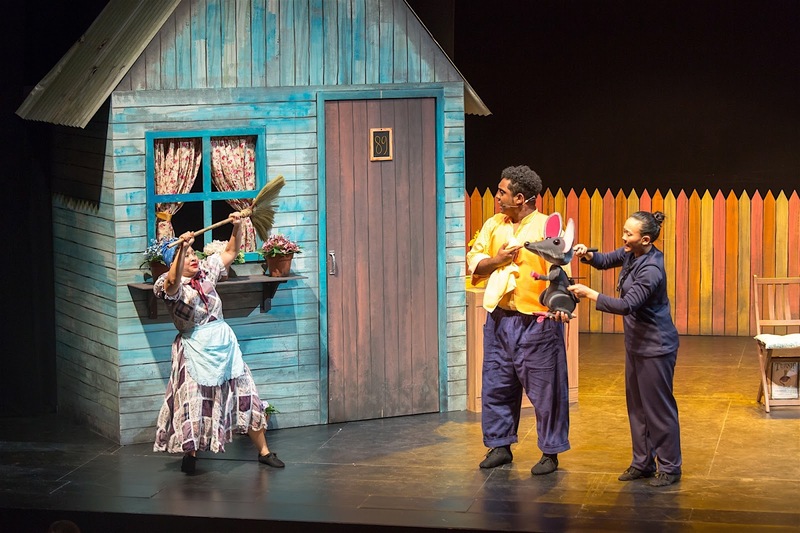 I Theatre has produced some of the most unforgettable family theatre Singapore and the region has seen – Rainbow Fish, Wizard of Oz, Ant and The Grasshopper, The Arabian Nights, Puss In Boots and many more! Disclosure: We received a media invite from I Theatre to review The Enormous Turnip. All opinions are our own. Great seeing you at the show! Love how spontaneous your girls pose for the camera. Great pics!